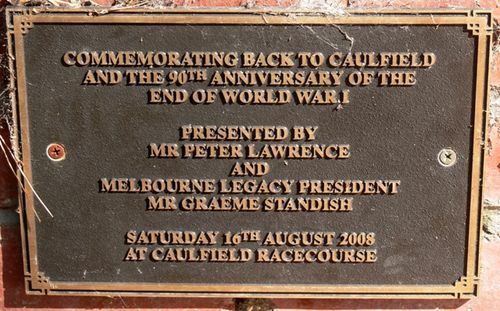 A plaque commemorates the 90th anniversary of the end of World War One and Back to Caulfield 2008. Back to Caulfield acknowledges the courageous deeds and contributions made for our nation by the men and women of the Australian Defence Force, past and present. The day raises much needed funds for Melbourne Legacy who care for the Australian families suffering financially and socially after the incapacitation or death of a spouse or parent, during or after their defence force services.